Bustown Modern, a constant source of vintage inspiration and great finds, published an astute blog post last year called “Lanvin’s Invisible Decade,” which you can read in its entirety here. While Bustown dismisses the label’s ubiquitous shirt dresses from the 1970s, we here at This Week’s Look take a different view. Those iconic, printed shirt dresses Lanvin churned out during the disco era may not represent the pinnacle of fashion, but those stretchy, often polyester, frocks reflect a rarely seen facet of the ’70s. They offer us a rare look at what every day women were wearing to work, to the grocery store, to pick up the kids, prepare meals, to do basically everything because, while moms were working, dads still felt entitled to do less around the house. As such, fashion had to be comfortable, versatile, easy to launder, and affordable. So this week, we pay homage to Lanvin’s Feminist Decade, which is certainly not as titillating as the glamorous disco-era fashions of the ’70s, but a fitting tribute to all those women who work hard for the money. So hard for it, honey. Vintage 1970s Lanvin iconic logo shirt dress with matching belt from SararaVintage on etsy. $200. Vintage 1970s Lanvin equestrian-print, shirt dress with matching neck tie and belt, purchased on eBay for $25. Vintage 1970s Lanvin op art shirt dress with matching belt from recollectvint on etsy. $170. 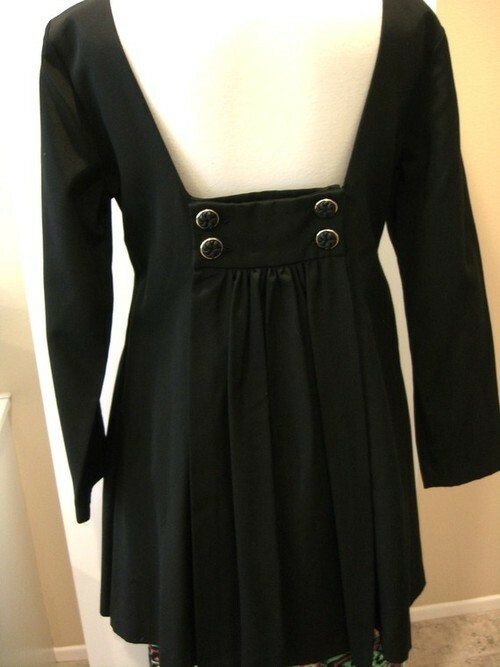 Vintage Lanvin shirt dress with matching belt on eBay. Current bid $100. Vintage 1970s feline print Lanvin shirt dress on eBay. Current bid $189 (close up of print below). Vintage 1970s silk Lanvin dress with trumpet sleeves and ruffled hem from Revolveexchange on etsy. $156. Vintage 1970s Lanvin logo shirt dress from Bustown Modern. $140. Vintage 1970s Lanvin creamy shirt dress in a satiny print (see close up of fabric below) from verybestvintage on etsy. $62. Close up of the above vintage 1970s Lanvin creamy shirt dress in a satiny print from verybestvintage on etsy. $62. 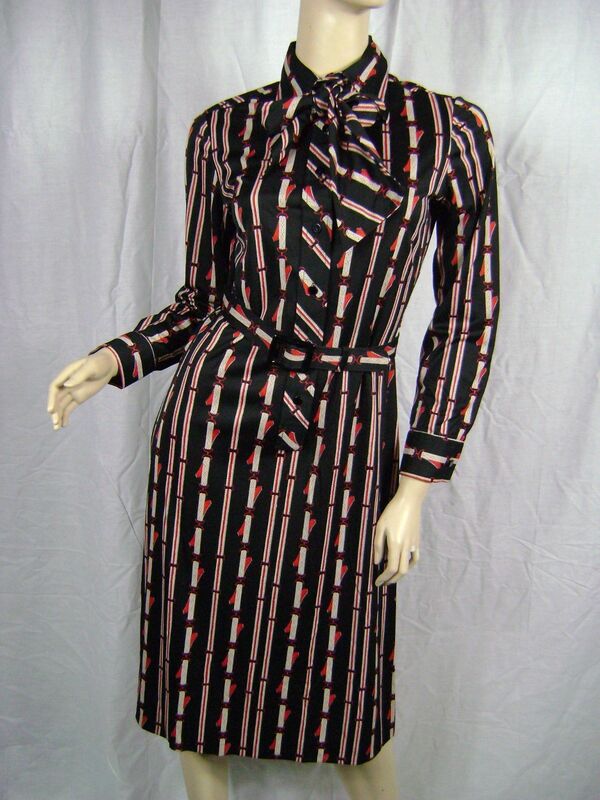 Vintage 1970s geometric print Lanvin maxi dress with matching neck tie from BlackPearlVintage on etsy. $125. Tunics are so versatile, particularly during the cooler months when you can layer them over pants or leggings as a top, or over thick, opaque tights as a mini dress. This week we have assembled for you a collection of 25 very wearable vintage (or vintage-inspired) tunics, all available on etsy and eBay as of today. Click on each image below to see the seller’s listing. Vintage 1960s bright red tunic or mini dress on eBay. Current bid $24.99. Vintage-inspired cotton sateen mini-dress made by seedclothing on etsy. $80. 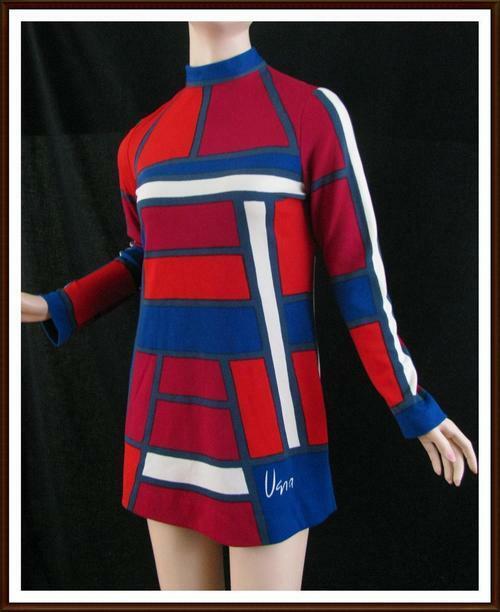 Vintage 1960s Mondrian-ish, space-age tunic by Vera on eBay. Current bid $16.99. Vintage 1970s Yves Saint Laurent sweater tunic from ArtifactVintage on etsy. $350. 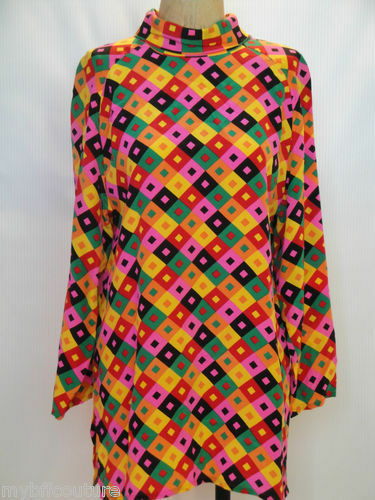 Vintage 1960s to 1970s Pucci-esque tent tunic on eBay. Current bid $19.99. Vintage Byblos turtleneck tunic from BlancheandEleganza on etsy. $80. Vintage 1960s black and metallic gold tunic from aiseirigh on etsy. $88. Unusual Anna Sui jacket, dress, or tunic – you choose – from OwlVintage on etsy. $155. 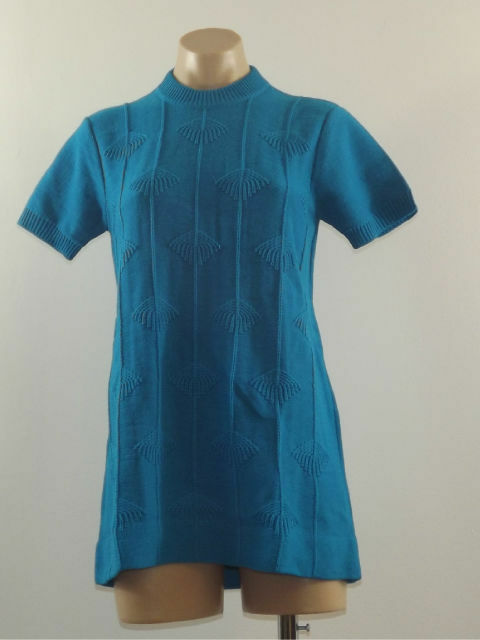 Vintage 1960s peacock blue sweater tunic on eBay. Current bid $17.98. 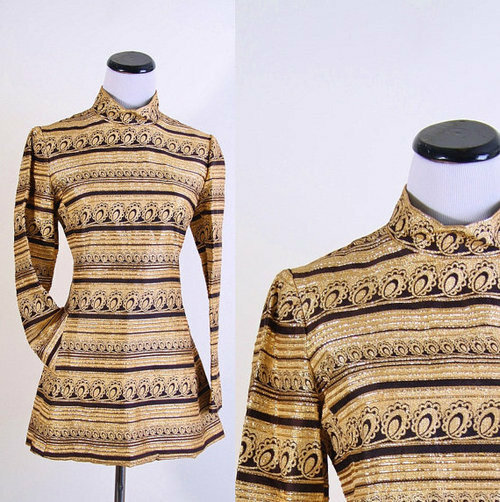 Vintage 1960s Mr. Dino tribal tunic on eBay. Current bid $36. 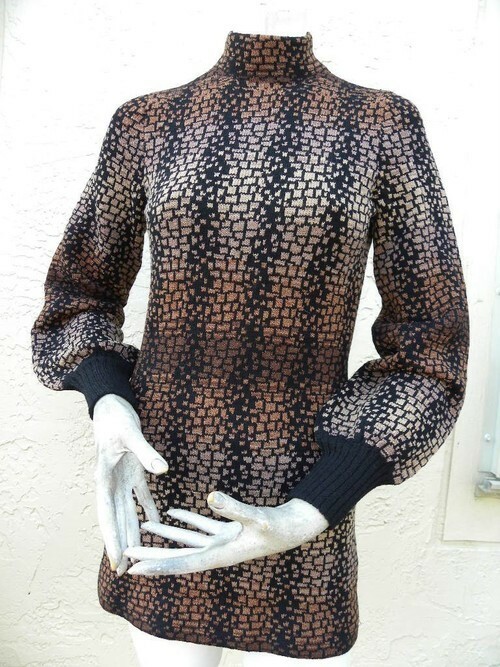 Vintage 1970s Adolfo for Saks Fifth Avenue leopard print sweater tunic on eBay. $99. 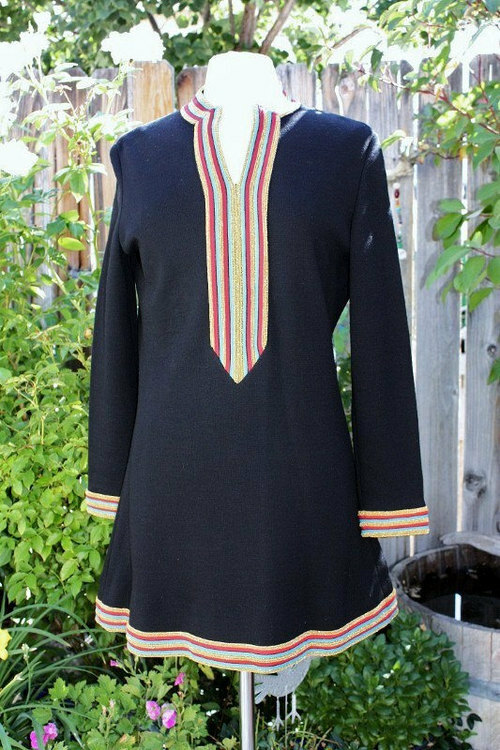 Vintage 1960s double-knit tunic on eBay. Current bid $9. Vintage 1970s Marimekko op art tunic/dress from worldmarketproductio on etsy. $95. 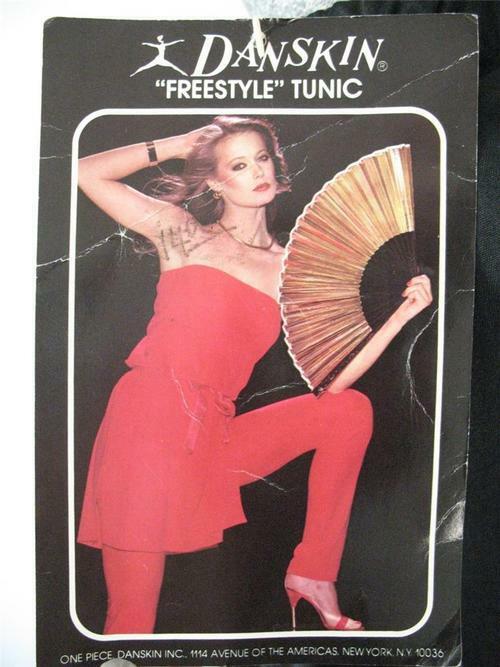 Vintage 1970s so Charlie’s Angels tunic pants suit on eBay. Current bid $150. 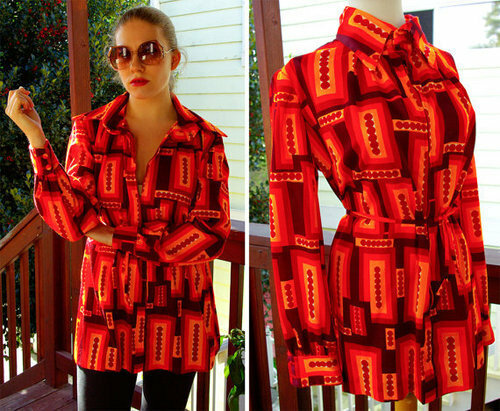 Vintage 1970s belted disco tunic in autumn colors on eBay. Current bid $38.99. Vintage 1980s or 1990s cotton tunic or mini dress on eBay. Current bid $9.99. Cotton -t-shirt tunic dress with lace sleeves and Peter Pan collar. Two colors available, made by DressupComeon on etsy. $32 each. Vintage 1970s to 1980s convertible, belted, disco tunic (can be a skirt too!) on eBay. Current bid $19. Vintage 1960s, space age, seafoam green, high neck tunic on eBay. Current bid $68. 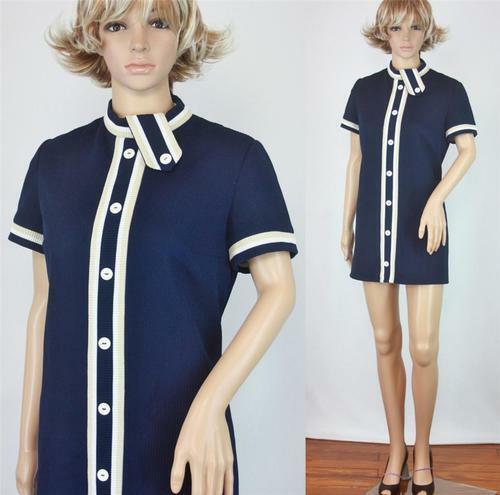 Vintage 1960s mod tunic or super-mini dress from LucyRayRetro on etsy. $25. 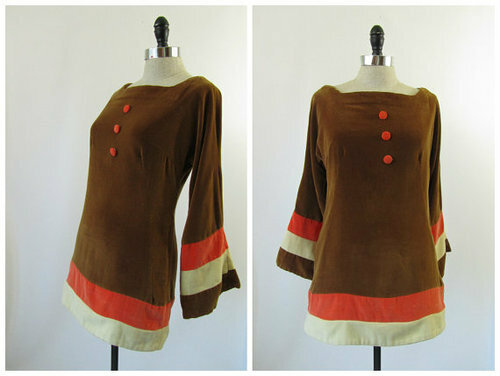 Vintage 1970s wool tunic with metallic trim from retromomo on etsy. $40. Vintage 1960s hand made tunic from boiledegg on etsy. $120. 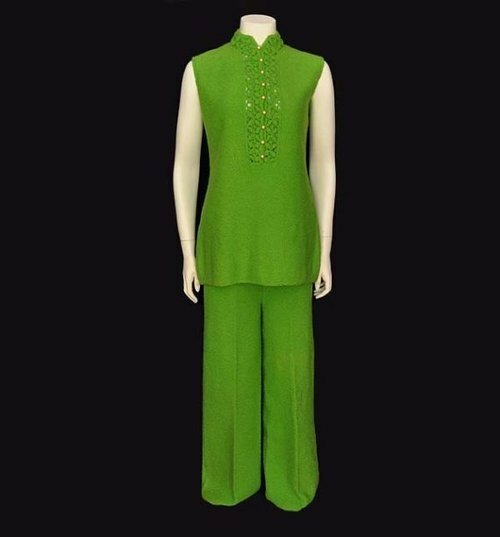 Vintage 1960s St. John Knits apple green tunic pants suit from Planetclairevintage on etsy. $92. Vintage 1960s velvet tunic with bell sleeves from 4birdsvintage on etsy. $95. 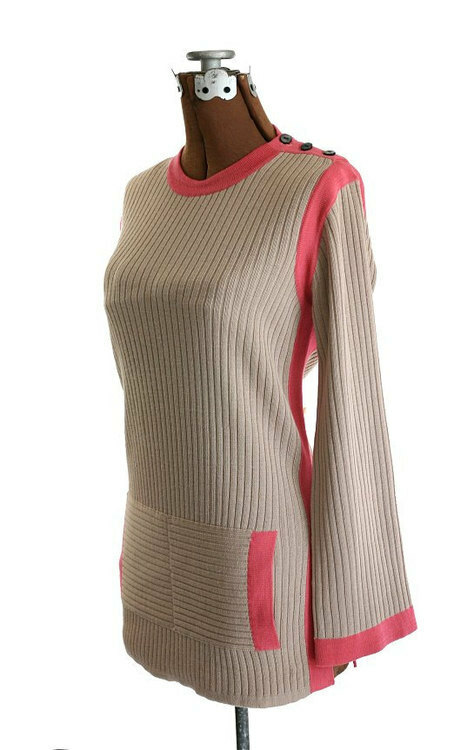 Vintage Guy Laroche geometric turtleneck tunic on eBay. Current bid $39.99. This week we found ten fantastic spring-hued dresses from the sixties, all up for bid right now on eBay. Click on the images below to see each seller’s listing. Vintage 1960s yellow silk dress with hounds-tooth ascot. Current bid on eBay is $21. Vintage Mr. Dino psychedelic abstract print shift dress on eBay. $155. Vintage 1960s crisp white space age/mod shift dress on eBay. $29.99. 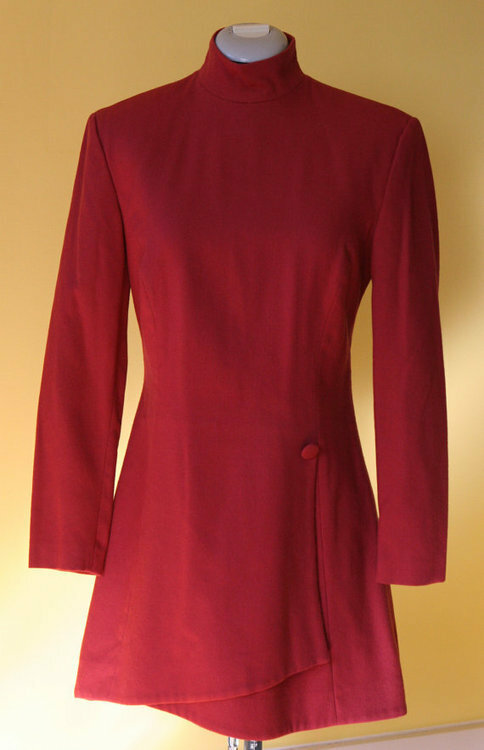 Vintage 1960s cherry red sheath dress with Peter Pan collar and bow tie. Current bid on eBay is $19.99. Vintage 1960s dress with delicate pintucks. $65 on eBay. 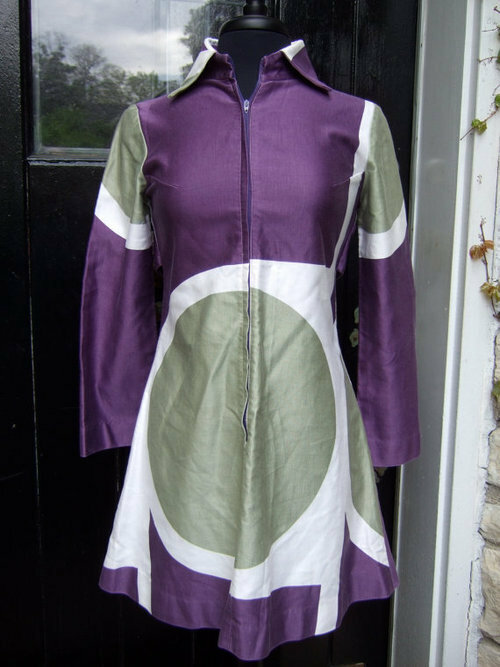 Vintage 1960s linen space age dress on eBay. Current bid is $89. Vintage 1960s turquoise dress with pointy collar. $49.99 on eBay. Vintage 1960s silky nylon purpley print dress on eBay. $61.20. Vintage 1960s mod scooter dress lined with satin. $178.14 on eBay. 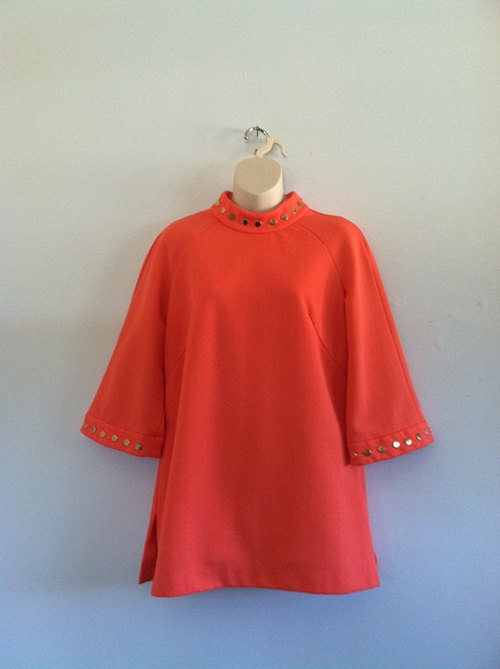 Vintage 1960s mod orange shift dress on eBay. $42.50.